Click here for all the pix from the day. Veteran proctor Robert Harper of TN addresses the students at the final test session. 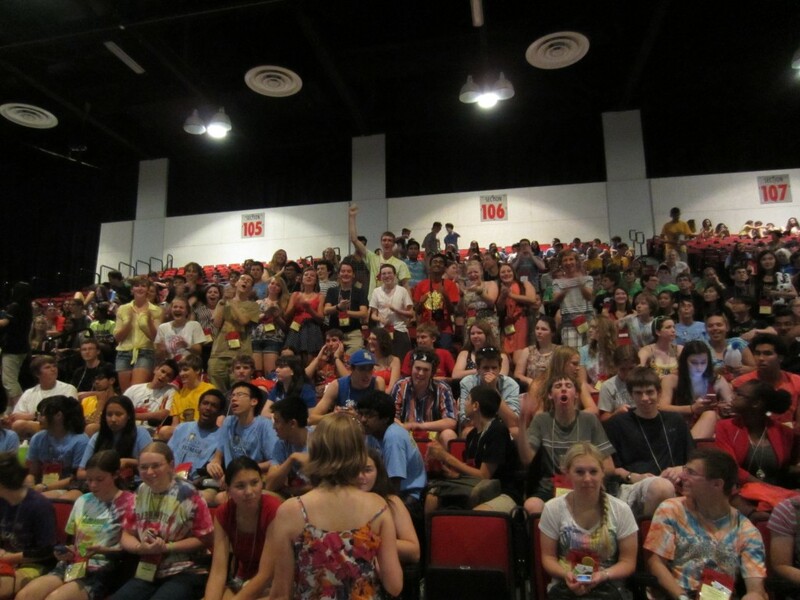 Click here for the winner of the Publicity Award, a parody of ‘Thrift Shop’ about certamen and state convention, by the Boston Latin School. Click here for the promo video for next’s years 2014 NJCL Convention at Emory University in Atlanta GA – I recommend just the first 2 minutes. Tullus from Summit at the test session. 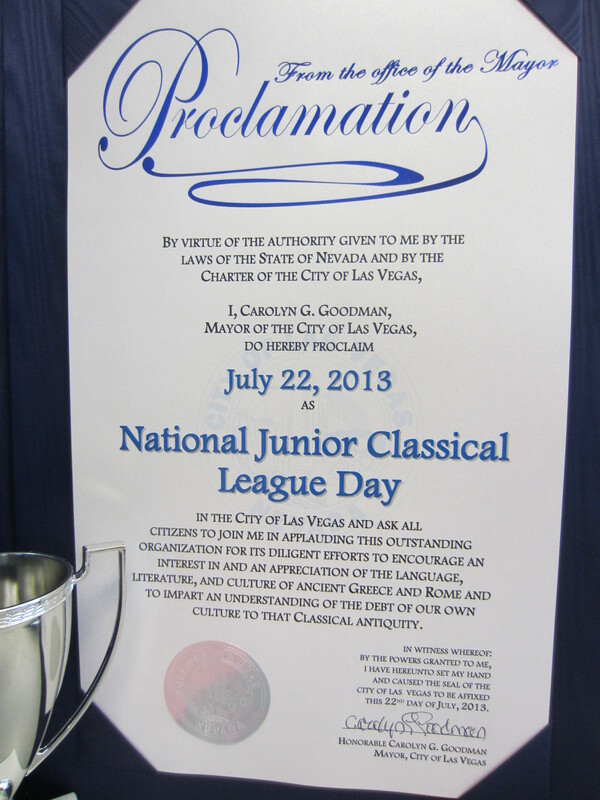 Contest session 4, the last one of the week, was today at 8 am, and I served as one of the proctors. The job is pretty easy: get everyone situated with their tests, scantrons, and pencils; make sure they are properly spaced apart; and help in collecting the materials when the students are done. There were so many proctors that I basically did nothing. 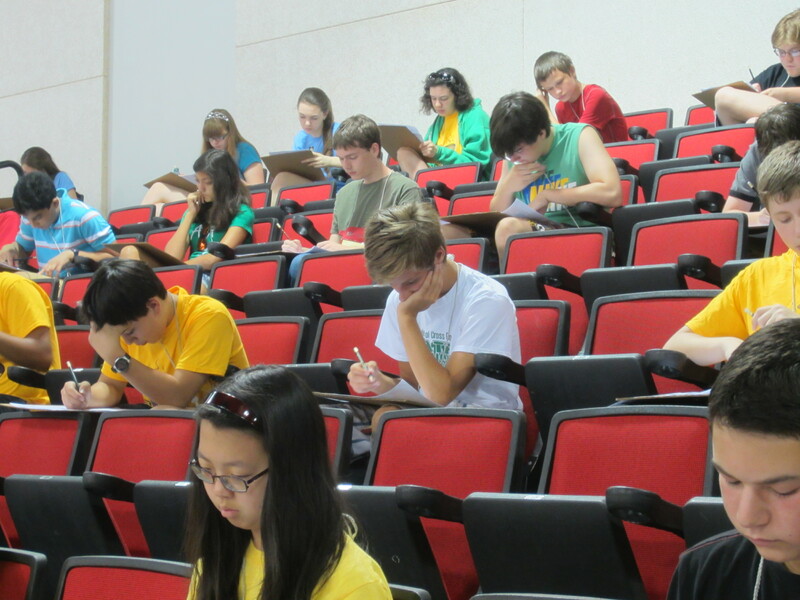 I did take a few pictures, but the enormous Latin brain power in the testing area cannot be adequately captured on film. 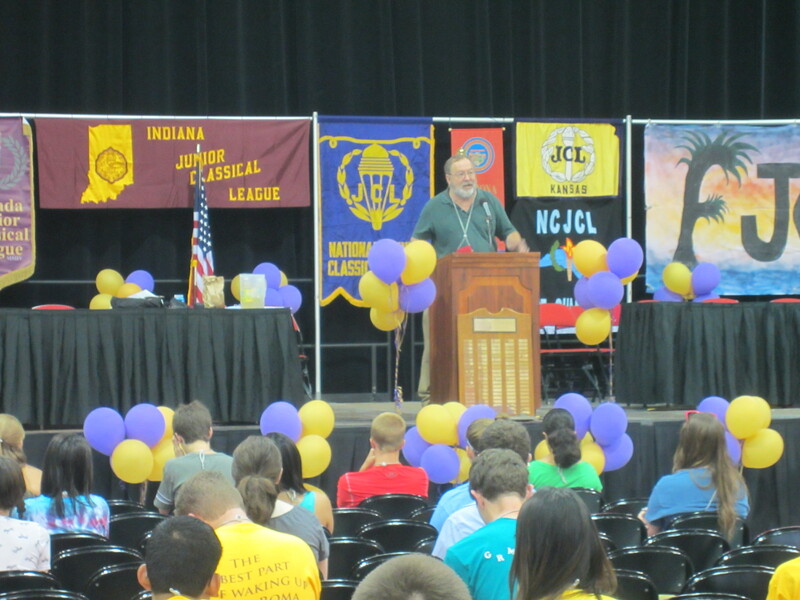 Robert Harper – who is not a Latin teacher but has attend 47 NJCL conventions – it’s true, it’s true – always presides over the test sessions. He gives instructions, keeps the time, tells some good jokes. Students are encouraged to mark their answers on the test and take it with them when they are done. 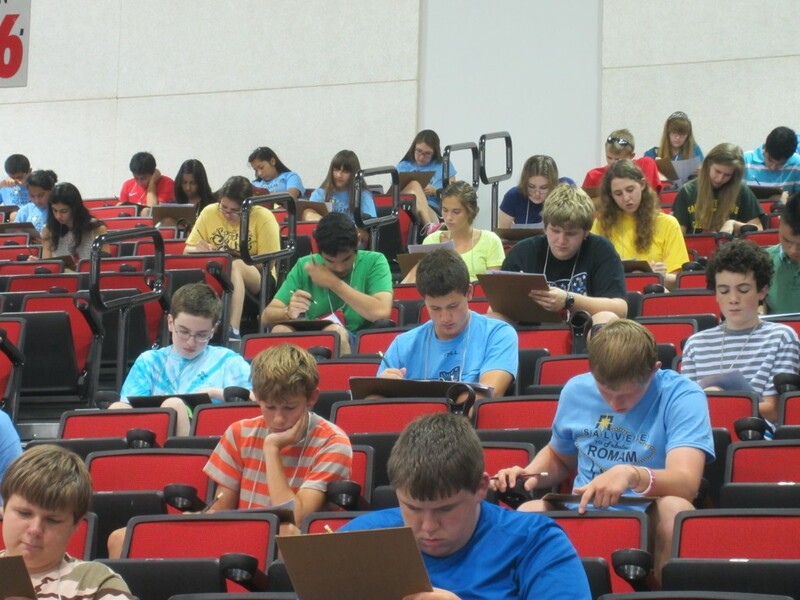 Many promptly check their answers with the official answers sheets which are posted directly outside the testing area, so they can get immediate feedback and alert the NJCL if there are any problems with an answer. Will from St. Edward and Anav from Shaker both spotted potential problems with the Reading Comprehension tests. 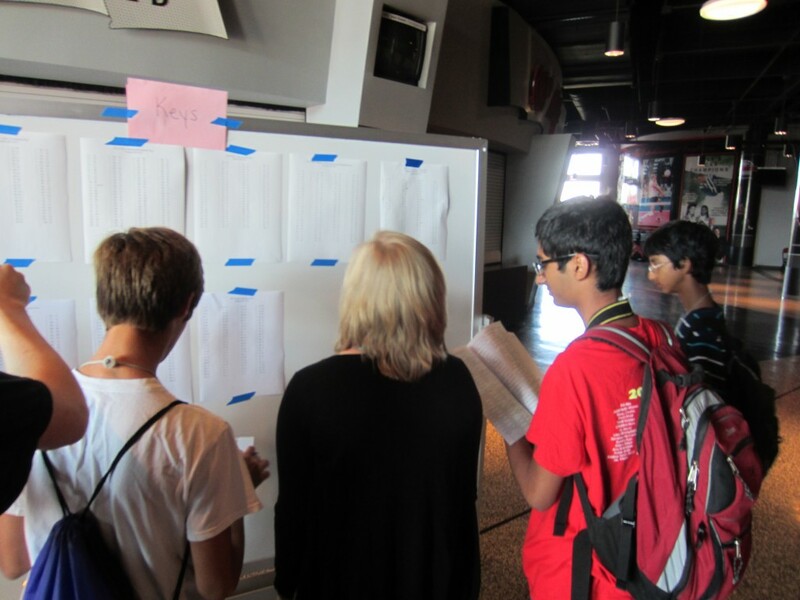 Tullus, Mollie, Narayan, and Anav check their tests. 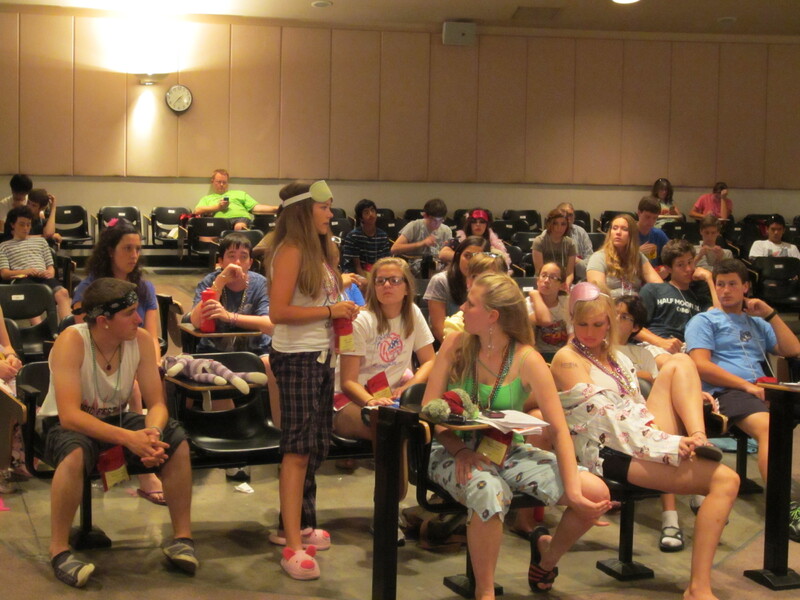 Next, it was the Semi-Final round for the OH Intermediate and Advanced Levels. All teams start with a tabula rasa – whatever state wins in the 3 different 3-team semis qualifies for the 3-team Finals. The Intermediate played well and got a few questions, but #1 seed MA won the round. To give you an idea of their dominance in the 3 preliminary rounds, MA had 675 pts to qualify as the #1 seed, and the #2 seed FL had ‘only’ 410 pts. Matthew from Shaker answered 2 of the questions in the Semis. The Upper level semis was an intense match between OH and TN and CA. OH jumped out to an early lead, but TN and CA clawed their way back into the match. The score was practically tied going into the final question. At this point, all possible disputes about any correct answers in earlier questions are decided. The certamen judges awarded CA 20 pts for an answer on #7 which had initially been ruled incorrect. Like any sport, when a close call is made against your team late in the game that profoundly impacts the outcome, the loss hurts much more. The extra points put CA into an insurmountable lead heading into the final question, but OH showed its pride and got the final answer with both bonus. 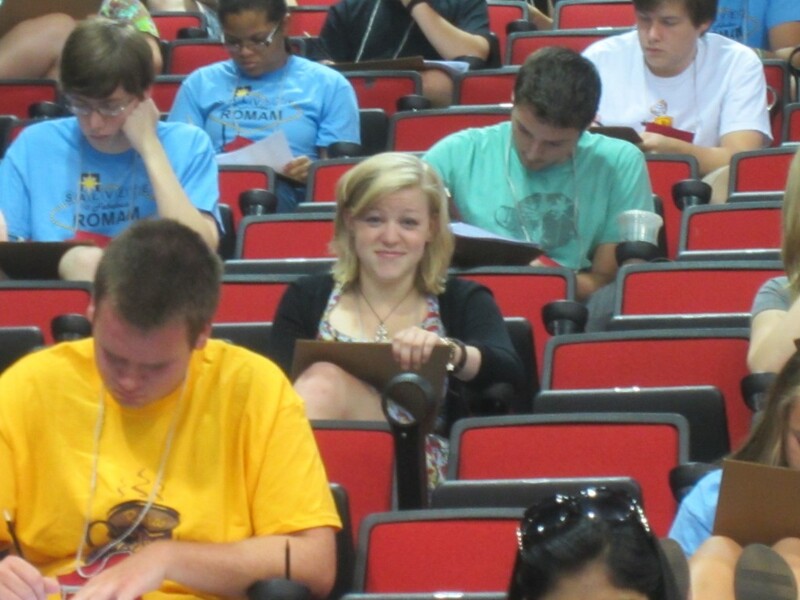 Mollie from McAuley graduated in May and will be heading to Notre Dame, so this was her last OH certamen match. Her smarts, her humor, and her lively personality will be missed. As for the future, the remaining 4 members of the Upper team + this year’s Intermediate team will be back next year. OH certamen will continue its excellence. Mollie Rox! She is formerly from McAuley, now from Notre Dame, but always from OHIO. Every state delegation met at 1 pm today for their voting caucus. OH gathered at its usual fellowship location. Parliamentarian Will Emery of Granville led the group through the process by which OH decides to whom it will give its votes. 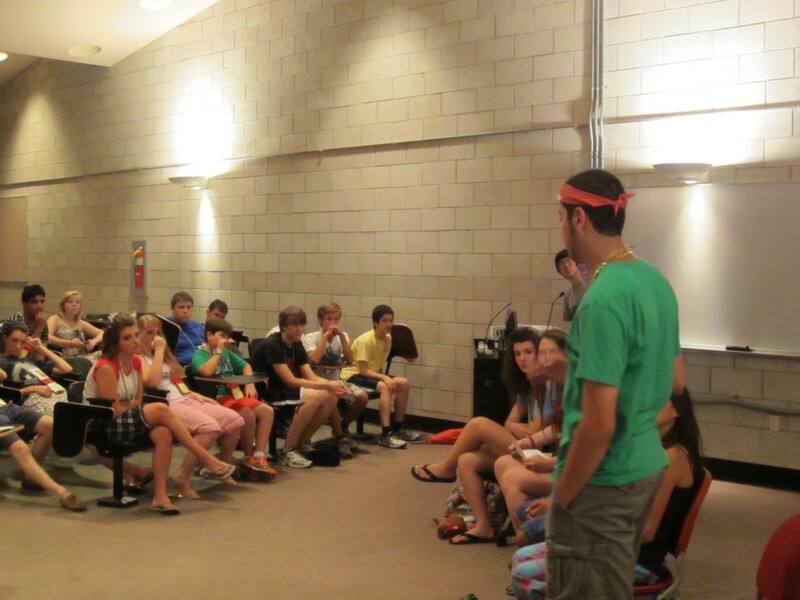 The only students permitted to speak were those who had attended at least 1 candidate event. It lasted about an hour. Will followed parliamentary procedure, and the OH delegates took this task seriously. It is a great exercise in civic duty. Hannah Barrett of Shaker Heights speaks at the Voting Caucus. Ra’ad of St. X addresses the delegation at the Voting Caucus. Becky Steffen of Westlake earned 10th place for the OH scrapbook featured in the Day 2 write-up. Ben Robertson of Shaker was honored as the only student at convention to earn a Perfect Score on the National Greek Exam. Heather Smith of Shaker was awarded one of the prestigious NJCL Miller Scholarships worth $6,000 over 4 years. Study of Latin = $$$$$! (sometimes). 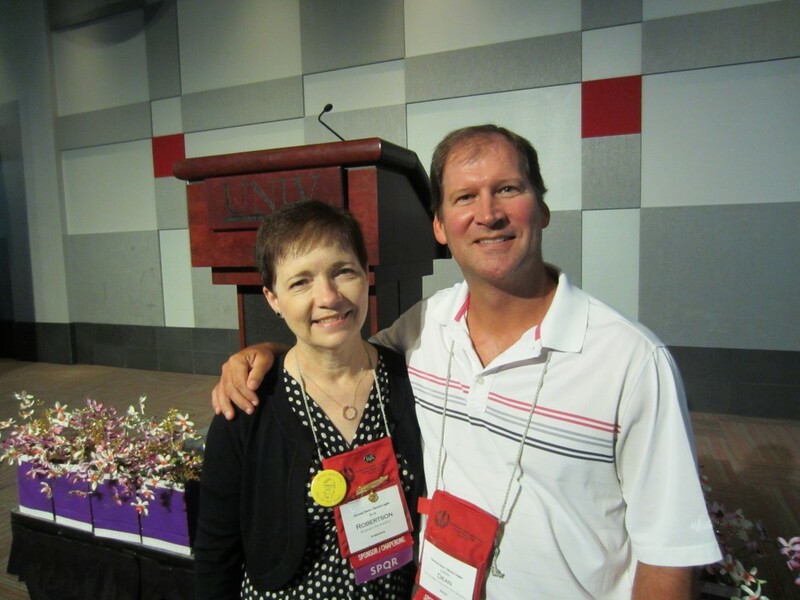 This GA recognized the long-time attendees of the NJCL conventions. I mentioned that Brian Compton of Moeller earned his 20 year Silver Bowl at the 1st GA. I am at 15. Melissa Burgess of Indian Hill thinks she is at 18, but she missed a few years and needs to check her notes at home. Julia is at 1, and Tullus is at 2. Steve Gentle, I think, is at 27. Susan Shearer of VA is at 53 years. It’s true, it’s true. The sponsors’ banquet was at 6 pm. 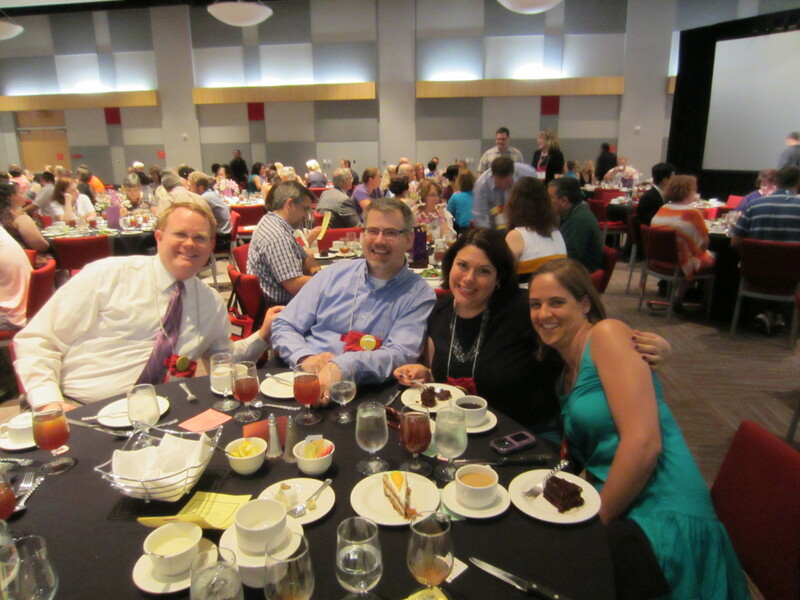 The OH teachers sat together and enjoyed the evening. After dinner, among other announcements, there is always a time when those involved who have passed away are remembered. Melissa wrote a very nice tribute to Andrea which was read. My annual photo with Sue Robertson, my Latin teacher. Click here for 2nd Place Winner Anav Sood playing a jazz song on the piano. Tomorrow’s big events are the toga parade and the Bad Larrys. 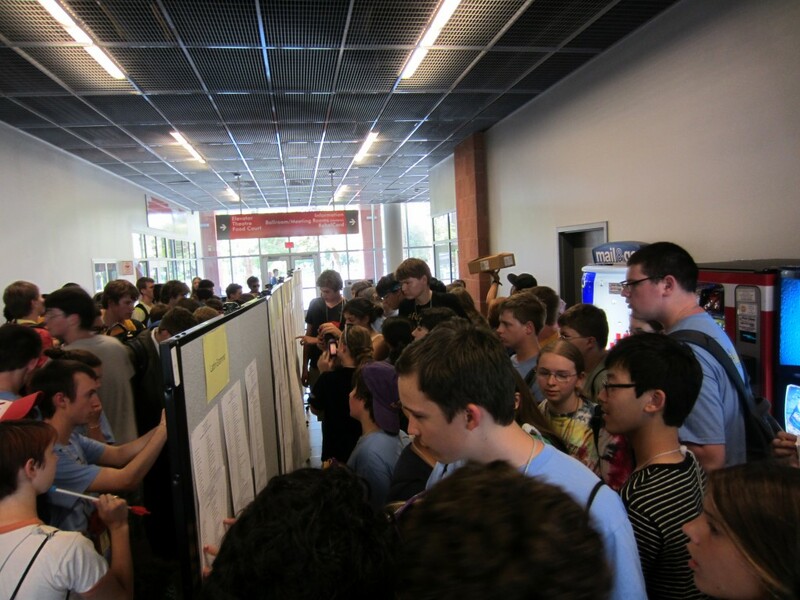 Students crowd around the newly posted test results.